This is one of the nicer summits along the Spanish "Pyrenean Axis" route, definitely my favorite of the last 3 passes in this category on this tour. The top is a high rolling plateau with great views, and two hilltowns along the way. 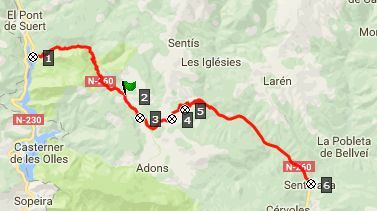 The second pass on this route the Collado de Llevata often gets equal billing, but it is really only a shoulder point. From East. When N260 departs from N230, south of El Pont de Suert, it leaves behind most of the traffic too. The profile starts a very short distance later, at a low point along a reservoir (the Noguera Ribagorcana), with a small, curious looking bridge: the Pont de Montiberri. Judging from the pictures I can find on Panoramio, this is the most popularly photographed scene by far along the entire route. There are somwhere over 30 pictures of this scene on Panoramio. I also take several. As you know by now they were on a stolen computer, and I included a couple of the Panoramio pictures in the slideshow, which have much more interesting lighting than I experienced. It is difficult to put one's thumb on what makes this scene interesting. I think it has something to do with the bridge, which seems to small to be useful, and you wonder weather it is about to fall apart or if it has ever been repaired. There is something strange in the scale. The scene has something surrealistic to it, but it exists in reality. The road ahead becomes a peaceful climb in the forest. Not until the first physical tiredness sets in, do the trees pull back at a few openings in the forest and the high peaks to the east become visible, but always with a web of powerlines in the picture. The first signed pass along the way is Port de Vio. Here the trees are below and a small group of old houses silhouettes perfectly in front of a large parade of snowcapped mountains. As the road enters onto a high rolling plateau this group of houses stays the scenic focal point for kilometers of swinging turns in the road. The next pass marked on the map is the Col de Llevata. All three roads from this intersection climb mildly away from the pass. It's a mystery to me what this pass divides. But the next marked and signed pass is the unmistakable summit, the Collado de Creu de Perves. The road makes a 90 degree turn to the north and throws open an unobstructed view of a long linear range. From East. (described downwards). At the bottom of this endless spaghetti road is another, from this perspective, very low hilltown: Perves. Surprisingly this is only a drop of about 100 meters down to the the village. I would have guessd that it is quite a bit more. The roll ahead presents every imaginable viewing angle onto this old village, and I too take a whole collection of pictures. Once at the "city" walls, it turns out to be a tiny place. The empty streets are walked to their locked ends in front of abandoned looking buildings and decaying walls in a matter of minutes. Even the cemetery has only a few old inhabitants, but again they have a very scenic spot. At some distance from the old settlement there are also a few newer houses. Surprisingly - the road just keeps on dropping into the bottomless forest after that, and now Perves has a different appearance. No longer the town at the edge of the tundra, now it's the row of houses far above on a cliff in the forest. After the last switchbacks the road widens and straightens considerably and takes on a more elaborately engineered roadbed. From the wide highway another small row of houses appears on the edge, Sarroca de Bellera. 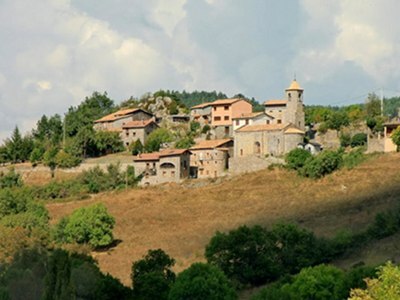 The profile ends in Senterada, a handsome village on the confluence of Rio de Sarroca and El Flamisell, with the occasional tourist business nearby, and a chance to buy more Salami.